Carla Bollard O’Callaghan’s Afghan Hound, Ch, GB & Int Ch Ashahni Amir, ‘Caleb’. Kaninchen Wire Dachshund, Marion, Tim and son Ian Finney’s Ch & Int Ch Nice One from Vitoraz to Gulliagh, ‘Nachos’. Pamela and Ryan Hunter’s Whippet Ch, GB & Int Ch Mossbawnhill It’s All Bout Me, ‘Pebble’. 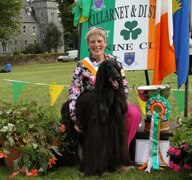 Sally Tonks and Dione Fitzsimons’ Pyrenean Mountain Dog, Ch GB & Int Ch Shanlimore Maverick, 'Darcy'. Ch, GB & Int Ch Ashahni Amir, ‘Caleb’.